Petrol and diesel prices are down today. 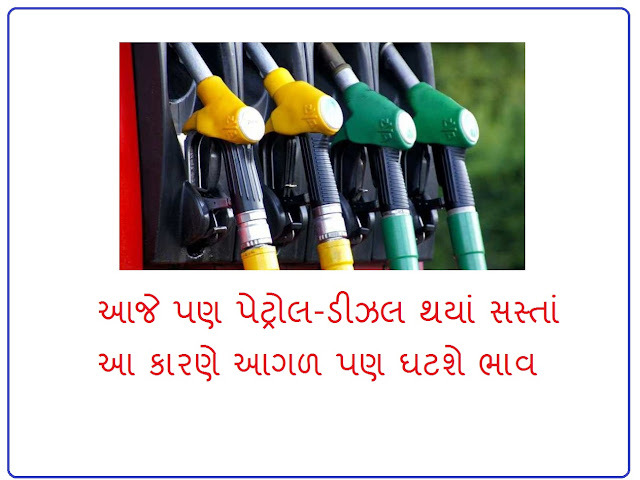 On Thursday, petrol was cheaper by 21 paise and diesel by 18 paisa a liter. After the price cut, petrol in Delhi is priced at Rs 78.21 per liter and diesel at Rs 72.89 per liter. Petrol and diesel prices have declined in the country's financial capital Mumbai. One liter petrol is 20 paise less and diesel 19 paise is cheaper. After the reduction, petrol was priced at Rs 83.72 per liter and diesel at Rs 76.83 per liter. In Gujarat, after the price reduction, Rs 75.34 per liter in Ahmedabad, diesel is Rs 76.18 per liter, while in Rajkot, petrol 77.03, diesel 77.129, petrol 75.9 in Vadodara and diesel 76.78 in Vadodara and petrol 75.13 in Surat and diesel 76.13 per liter. The international crude oil prices have continued to decline. If you believe in experts, then this relief will be continued further. These benefits are available in the form of a reduction in petrol and diesel prices. Petrol diesel will continue to be relieved as the US has given permission to buy crude from Iran. It is decided that the benefit of this relief will be available to India on a temporary basis. 0 Response to "Even today petrol and diesel are cheap, due to this the prices will also fall further"